The Spicy 5: Each Capsule contains a proprietary blend of Organic Ground Turmeric, Organic Ground Ginger, Organic Ground Cayenne, Organic Ground Garlic, and Organic Ground Black Peppercorns. Summary - This super duper immune booster is a 100% Organic Blend of Turmeric, Ginger, Garlic, Cayenne and Black Pepper. The combination of these herbs/spices have Anti Viral, Anti Bacterial and Anti Fungal properties as well as other powerful attributes. A little bit of these spices taken daily can help the immune system ward off all types of colds and flu's as well as help with many types of illnesses and diseases. Therapeutic doses can shorten the duration and intensity of colds and flu's that have already taken hold in your body. As with any supplement regimen results are cumulative over time. 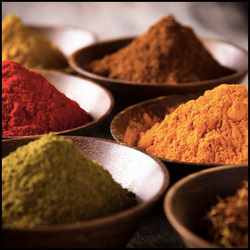 In therapeutic situations The Spicy 5 works very well in combination with Organic Vitamin C.
Spicy 5 Benefits: - These 5 herbs/spices are excellent for casting a wide protective net over the immune system. They have a multitude of benefits to the human body, some of which are: strong Anti Viral, Anti Fungal, Anti Bacterial, fights a multitude of illness and disease, retards tumor growth, regulates blood sugar, defends against allergies, helps expel parasites, helps fight off infections, has expectorant qualities, and much more. For more detailed benefits please refer to individual resource articles below. Disclaimer: Please understand that these product ingredients occur naturally in nature. They are from the earth and are not synthesized in a lab with any chemicals or additives. They are not pharmaceuticals and should be treated as an entirely different entity. The information provided here is for educational purposes only, and should not be used to diagnose and treat diseases. If you have a serious health problem, it is recommend that you consult a competent health practitioner. Each product states what it has been used to aid as well as links to supporting data from other web sources. There are no claims that these products will cure any diseases or that they were created to cure any disorders. These statements and links are merely reporting that people have used these ingredients to aid any conditions listed. The information on this web site is for educational purposes only. Always consult with a qualified health practitioner before deciding on any course of treatment, especially for serious or life-threatening illnesses.